A Community Wildfire Protection Plan (CWPP) is a mechanism for communities to address their wildfire risk by promoting collaboration and local action. 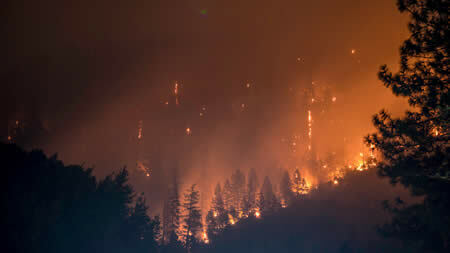 In 2003, congress passed the Healthy Forests Restoration Act with the stated intent of reducing destructive wildfires across the United States. One of the key outcomes of this law was to incentivize communities to make a CWPP because, once approved, a CWPP can influence and prioritize the allotment of federal funding for fuel reduction projects. A CWPP must meet three basic criteria: it must be developed in collaboration by local and state government representatives, it must identify and prioritize areas for fuel reduction, and it must recommend measures homeowners and communities can take to reduce structural ignitability throughout the area addressed by the plan. The 2010 Santa Cruz County and San Mateo County CWPP is currently in revision by CAL FIRE, representatives of local fire safe councils, and the Resource Conservation Districts of both counties. Check this page later this year for an opportunity to comment on draft revisions.